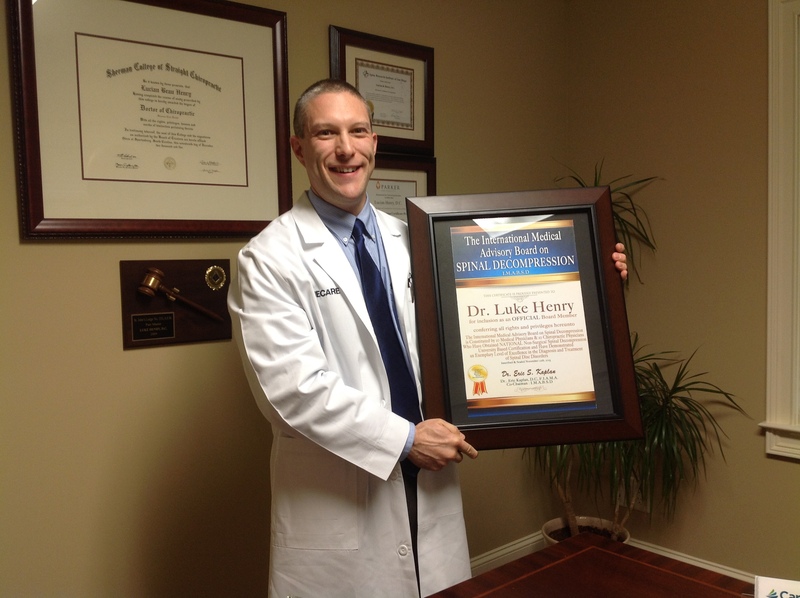 On November 12, 2015 Greenville chiropractic physician Dr. Luke Henry was reappointed to the International Medical Advisory Board for Spinal Decompression (I.M.A.B.S.D.). This group of of medical and chiropractic physicians contribute clinical and scientific expertise towards to continued development of this noninvasive approach for disorders of the intervertebral disc. Dr. Eric Kaplan, co-chairman, and Dr. Perry Bard, board member, congratulated Dr. Henry. The I.M.A.B.S.D. works in conjunction with Parker University, a leader in chiropractic education and provider of postgraduate continuing education on nonsurgical spinal decompression therapy. Decompression is a relatively new approach and represents a technological advance over simple traction. Decompression is indicated for bulging discs, herniated discs, degenerative disc disease, facet syndrome, sciatica, low back pain and neck pain. Dr. Henry has served as an instructor at Parker University’s National Decompression Certificate Program and as proctor for the examination 2014-2015. He is also the author of peer-reviewed research papers and presentations on chiropractic, low-level laser therapy and nonsurgical spinal decompression.